I’m encouraged. Yesterday, I had a great run. I ran at least 6 miles and without my running buddy. I never run well alone, so I was thrilled that I made it that far without her. I’m sure I could’ve done at least another 2 miles, but poor Baby J was getting really antsy. Every time we passed the playground, he started getting upset, because he wanted to play. I kept telling him, “Soon, soon,” and he was being so good about it that I couldn’t do any more laps. Not fair to him! As far as the distance, it might have been 7 miles. You see, when my running partner and I started training in the fall, we had several people tell us that a particular track was 2 miles around. Well, when I started using RunKeeper a few weeks ago, it told me that 2 mile stretch was actually only 1.8 miles. That’s a little depressing! I need to verify that, maybe with the MapMyRun app. In the meantime, I ran what we used to consider 6 miles, and then threw in an extra 11 minutes of jogging, just in case. I have to be honest and say that I did stop during my run. I had a bathroom break after the first 2 miles, and then had to stop several times quickly to adjust my son’s gloves, and once to tie my shoe laces. Also it was pretty slow, so “jog” would be more accurate. I didn’t time myself, but I’m sure it was at least a 10 minute mile. BUT all that said…I did run the entire distance, so that’s really encouraging. I think at this rate, my long run can be up to 10 miles in February, which definitely puts me on track for the half-marathon in April. It’s going to be okay! There’s a 5K next Saturday that I really want to run, but we’re trying to be frugal right now. The registration fee isn’t expensive, but I can think of several things that I should spend money on right now before a race, so it’s probably not going to work out. I’m going to head out in a bit with Baby J to go run some more. Can you believe it’s 15 degrees colder today than yesterday? The weather here is so back and forth. I’ll probably put Baby J in a snow suit, so he can stay warm even with the wind. I’m very jealous of those of you with treadmills and ellipticals at home, by the way! I just need 2 miles today to meet my Winter Miles Challenge goal for this week. Oh, I’m behind on my push-ups. I’ll have to do them twice today. Yesterday I blogged about Fitness Friday on my other blog. You’re welcome to swing by and tell me about your goals! Also on mylifeaworkinprogress.com, I reviewed the Armpocket, and I’m giving one away. This armband is awesome! There are several models to fit different sizes of phones, and some of them have storage room for gel packs, lip balm, IDs, etc. It’s really cool! You can check out the review HERE and the giveaway HERE. And I’m also participating in a giveaway for the Bowflex Boost fitness tracker. Super jealous of whoever wins that one! How was your Friday? What does your weekend look like? 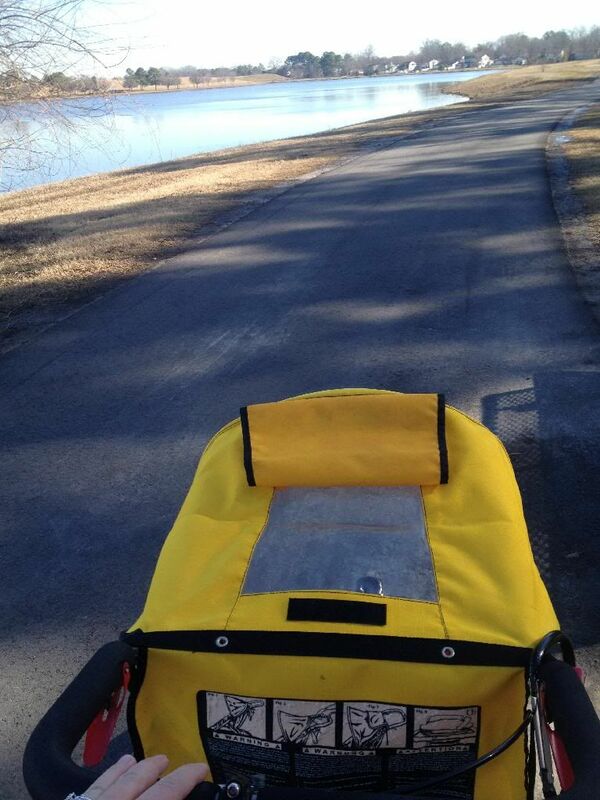 This entry was posted in Running, Winter Miles Challenge 2014 and tagged jogging stroller, running on January 18, 2014 by Elisebet. I applaud you for “jogging” that much, especially with a child! You go! Thanks, Maggie! There are so many moms and fitness bloggers out there who accomplish AMAZING things, so I still have a long way to go. BUT, a year ago, I never imagined I’d be running this often or this far. You did great! Good luck on your upcoming half marathon! You got this!! This is amazing. Congrats on your jogging achievements. I want to run but with three kids that is not possible at the moment. When my oldest two start school this year I will definitely invest in a jogging stroller to go running the trails. I look forward to seeing how your running progresses over the over coming months. Hi, thanks! And yeah…I don’t think they make a 3-child jogging stroller. At least, if they do, I’ve never seen one! Good for you on the jogging and without your jogging partner, amazing! Normally for us is soccer night and while we did still go, my husband didn’t play because he hurt his back while at work, but we did go out to eat at least after! That is awesome! Way to go. I need to start jogging with my Little Man. Now that it will be warming up. I’d like to do a 5K – the Color Run maybe? Keep it up! The Color Run sounds like so much fun! I don’t think that’s coming to my area this year, but Color Me Rad is. WOW! What an inspiration, 7 miles is amazing! I haven’t done that in years… I’m hoping this year I can get back to it. I do a fitness friday every week, you should link up for sure – you’re such an inspiration, we’d love to have you! Thanks, Danielle! And you can get back to it in no time! It really only took me a few weeks to get back into running this past fall, and that was after a couple years of pretty much NO running. I got off track during the holidays, but getting back there. I’ll definitely be linking up, thank you! It is hard to balance wanting to do races with the registration fees – that’s one of my main problems these days! Glad to know it’s not just me! Hi Denise, I’m in Southern Virginia. The temps in our area are a little weird. We’ll be in the 60s one day and 30s the next. Not sure we’ve been much below 30 yet this year. If I run in the 30s, I put my son in a snowsuit! It might be overkill, but I want to make sure he’s warm.